Bloop bloop bleep. Spice up your accessories with a cool Star Wars themed R2-D2 USB Car Charger. 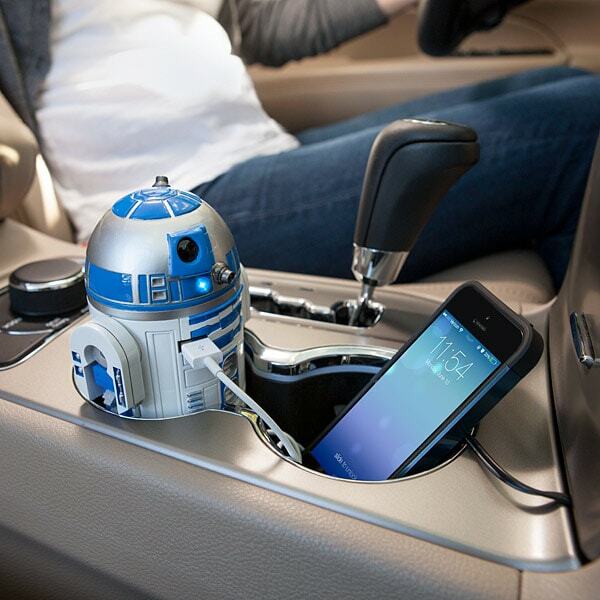 Look and feel totally geeky with this little R2-D2 crossover to charge your phone in our car wherever you go. With the upcoming release of the new Star Wars movie, you definitely want to have an R2 unit inspired charger to save your dying device. This handy little R2 unit has 2 USB port to rescue 2 devices at once, just hook it up to the car’s cigarette lighter and start charging. Each port provides 2.1 Amps, capable of charging 2 tablets simultaneously. It even lights up and sound like a real R2 unit to indicate that your device is charging. Even better when it can fit inside your cup holder for easy storage. What better way to show off your inner geek other than with this officially licensed Star Wars merchandise. Grab one now and may the force be with you!